The main concession India hoped to obtain was the granting of permission for overland access through Bangladesh to India’s seven land-locked northeastern states. This would help open up the region to mineral exploration, including for oil, gas and coal and be an important step toward realizing New Delhi’s ambtion of using the region as a gateway to south-east Asia. But Bangladesh put off granting overland access after India reneged on a commitment to sign an agreement to share the water of the Teesta river, which flows through the Indian state of West Bengal before entering Bangladesh. Though a water-sharing agreement had been reached after months of negotiations, Singh announced on the eve of his departure for Dhaka that India could not sign such an agreement without first reaching a domestic consensus. Singh’s announcement came in response to the decision of West Bengal Chief Minister Mamata Banerjee not to join Singh on his Bangladesh visit due to her objections to the proposed water-sharing treaty. Banerjee said that 50:50 sharing of water between the two countries would harm the interests of West Bengal farmers, adding that she was not properly informed about the impending treaty. 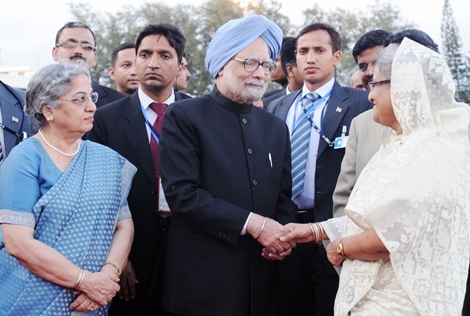 That Manmohan Singh bowed to Banerjee’s opposition thereby damaging a long-prepared attempt to elevate relations with Bangladesh to a new level underscores the weakness of the Congress Party-led UPA government. Constitutionally foreign policy falls fully under the purview of India’s central government. But with 19 seats in Parliament, Banerjee’s Trinamool Congress is the second largest constituent of the UPA and Singh and the Congress Party leadership can ill-afford to alienate it. To prevent the visit from becoming a total failure, Singh did proceed with several other planned agreements, including a boundary settlement, a framework agreement on bilateral cooperation, and agreements to give duty-free access to the Indian market to 46 Bangladeshi textile items. Due to the world economic crisis Bangladeshi garment manufacturers, who account for more than 80 percent of the country’s exports, have been squeezed in their two largest markets, Europe and America. Dhaka is therefore anxious to gain access to the Indian market for its garment makers. However, this increased access is not expected to significantly reduce the $3 billion trade surplus India currently enjoys with Bangladesh on a total trade of just $4 billion per year. Even with the lifting of the restrictions on Bangladeshi garment exports to India, 400 Bangladeshi goods remain on India’s negative or tariff list. Bangladesh’s main opposition, Bangladesh National Party (BNP), has long opposed any suggestion of a transit agreement with India. Prime Minister Sheik Hasina had sought to offset such opposition by pointing to the benefits a water-sharing agreement with India would provide Bangladeshi farmers. Currently, the Teesta Irrigation Project, the largest of its kind in Bangladesh, does not get enough water during the dry season to sustain its irrigation commitments. When the project commenced in 1998, it had an initial target to provide irrigation to 111,406 hectares of land; however, due to low flow of water in the Teesta river, the target was reset to 42,500 hectares for this year’s rice season, heightening the discontent among farmers. An editorial in New Age was blunter. While stating that India could not be trusted, it declared that the government “deserves praise for not entertaining New Delhi’s request for transit facilities over land. Transit, as many experts have pointed out, is a trump card for Bangladesh and the government should use it to the country’s maximum benefit.” The editorial further argued that Bangladesh “should reconsider its decision to allow India the use of its Ashuganj-Akhaura rail route” in retaliation. At present, India’s northeastern states are connected to the rest of the country by a narrow stretch of land, the Siliguri Corridor or Chicken’s Neck, which at its narrowest point is only 21 kilometers wide. The alternative to land transportation is developing air transportation. The Union Ministry for Development of the North-East Region has proposed increasing intra-regional air connectivity through smaller airports and smaller aircraft. But this plan has been deemed unfeasible due to its high cost. Though the visit ended without the desired agreement, both sides tried to salvage the event by underlining their continuing cooperation. The ruling Awami League, which historically has been closer to India than the BNP, gave a signal to New Delhi that it was eager to develop closer collaboration shortly after it returned to power in 2009. It arrested United Liberation Front of Assam (ULFA) chairman and founder Arabinda Rajkhowa near Dhaka in late 2009, then turned him over to Indian authorities. Until then Bangladesh had tacitly accepted the ULFA’s activities. The ULFA is fighting to establish a separate State in northeastern Assam. Reacting to Rajkhowa’s delivery into Indian hands, Singh announced that New Delhi was extending a $1 billion line of credit to Bangladesh on favorable terms for development projects. By so doing, India sought to lessen Bangladesh’s dependence on China for infrastructure development. This entry was posted in News and tagged economic cooperation, India-Bangladesh ties, river disputes, SAARC, South Asian Free Trade, terrorism. Bookmark the permalink.